We often hear from folks who are both excited and anxious about the potential of using WordPress. They see a theme they really love, or get excited about having a site that includes features they really need. However, they’re hesitant to make the switch to the self-hosted version of WordPress because they are uncertain as to what it entails. As a result, they settle on a different website platform such as Squarespace, Wix, or the hosted WordPress.com version that they feel is easier to get started with. This means musicians end up lacking several key features on their website simply because they fear getting started with a WordPress website. Even though we’re not able to offer WordPress setup as a service at AudioTheme, we want to explain what it takes. 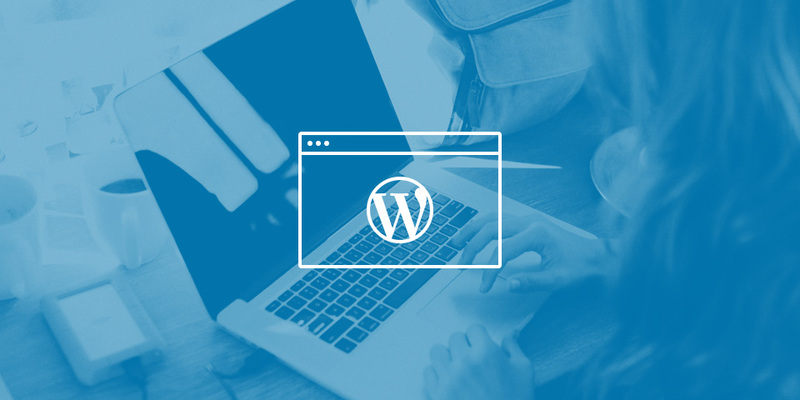 We’ve put together an overview on getting started with WordPress for all of those customers who want to learn more about it. If you’re still not sold on WordPress, do a quick Google search for all of the WordPress related blogs, inspiration, and support sites. Since over 20% of all websites are now using the platform, you’ll find that it gives you much more flexibility and many more options than any other web platform. Purchasing a domain name is a relatively simple process. The nice thing is that there is hardly any difference in product between service providers. Since your site’s URL is only pointing to a resource (in most cases a website), there is not a ton of research to be done. Choose your domain provider based mostly on their service, reputation, price, and support availability. Some providers will offer additional perks on top of the typical domain registration to try and set themselves apart from other providers. An example of this is free “Whois Protection” which will keep your registered information from being displayed online. Other offers may include purchasing additional domains for reduced prices with the purchase of a primary domain. A few popular domain registrars include: GoDaddy, NameCheap, BlueHost, and HostGator. Of course, there is something to be said about the ease of use that comes with having your hosting package and domain name with the same company. In fact, most hosts actually throw in a domain name for free with a new hosting package. It usually renews at a yearly rate of somewhere between $10 – $15. Hosting plays a much larger role in your site’s performance, so take your time and do some research. While it can be tempting to go with the first or cheapest host you find, there are several factors to consider. The WordPress Codex has all of the information you could possibly need about the platform. The FAQs on installation give you the details on what to look for in a host. That list probably seems like a foreign language if you haven’t heard of any of those technologies before. Don’t worry, the hosts you’re vetting will know exactly what they are. In fact, since the platform is becoming more popular, most hosts call attention to the fact that they support WordPress. Some hosts offer the service of one-click installs, or offer to manually install WordPress for you. A manual install isn’t wildly complicated, and is well documented on the WordPress Codex. However, these services can make getting started with a WordPress website a lot easier. There are a few more things to consider before you decide which hosting company to use. Some of the more obvious things are speed, uptime, and support. In addition to those, some hosts go above the standard offerings and provide you with additional services such as email, SSL certificates, one-click installs, automatic updates, and site backups. Some companies take excellent care of you in the beginning of the relationship. But over time things can change. I have been extremely happy with the service received by multiple hosting companies until I have spent a few years with them. All of the sudden I find unexplained increases in my bill, or have to wait hours and hours to get in touch with their supposed “24/7” support. This is why it’s incredibly important to read reviews of hosts, especially those from long time customers. Better yet, if you know someone who has their own site, ask them who they host with and if they are happy. You can simply search for reviews on Google for the hosts that you are interested in. Be sure to read several reviews on multiple sites, as a lot of review websites are mainly used for affiliate marketing and will claim that every host is “the best.” Look for more reputable sources, such as Review Signal. Nearly every host offers an “economy” hosting package. Those packages meet the minimum requirements of WordPress, and should be fine as you’re getting started with your site. However, as your site grows and gets more traffic, it may not perform as well. In fact, if your site is loading incredibly slow or audio files are timing out, it is most likely due to poor hosting performance. If you get a fair amount of traffic, we’d recommend purchasing at least the middle tier of hosting from most companies. Another common marketing tactic among hosts is advertising ridiculously low prices. After a year of service, you can see those prices jump to 2X their initial amount. This is common as hosts are trying to gain your initial business. Just be sure to look for a disclaimer somewhere on the website explaining what the package renews at, and include that in your budget. Keeping your hosting plan and domain registration with one company can make things easier on you. If you run into issues trying to get your domain pointed to the right nameservers for instance, a support tech can help you easily if both products are provided by the same company. Don’t let this ease of use pigeonhole you into staying with a hosting provider that does not provide value or treat you properly. Pointing a domain name from a certain registrar to another company’s nameservers is not only possible, but extremely common. Over the years, we have seen tons of customers treated well with SiteGround. 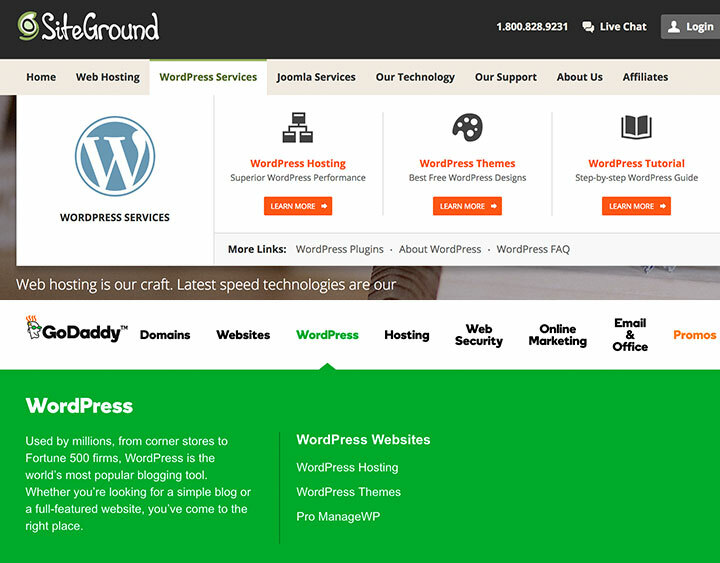 SiteGround offers one-click installs, auto-updates, email, free SSLs, and site backups. However, as mentioned before, their “StartUp” level of hosting isn’t suitable for the majority of our themes or plugins. Our products and many others perform well on the “GrowBig” and “GoGeek” hosting options. You can learn more about SiteGround here. That is an affiliate link, and if you choose to host with SiteGround, we’ll receive a small monetary reward. SiteGround is the only host we have an affiliate account with because we truly believe they are the best choice for our customers. Once you have your domain and hosting account with WordPress installed, you can start creating your site! Themes and plugins are the best way to change the look and extend functionality to a site. You can find tons of awesome themes available for free in the WordPress theme directory. You’ll also find plugins which can extend the functionality of WordPress. If you’re wondering if WordPress can do _______, chances are there is a plugin for it. The WordPress Theme Directory has thousands of free themes. If you’re looking for more functionality, there are several theme shops that focus on selling themes and plugins. ThemeForest is a great example of these, as it has thousands of themes available for purchase. One of those themes happens to be our latest – Merchato. In addition to hosted theme shops which include products made by several different companies, you’ll also find individual companies that create WordPress products. AudioTheme is an example of these types of companies. You can find other trustworthy theme shops on this list from Foxland. One of the best advantages to using premium theme shops is that they tend to make more of an effort to release new features and updates, as well as stay on top of the latest technology, and changes in WordPress. Getting started with WordPress seems like a big task. With the increasing popularity of the platform, many hosts are happy to help with the first few phases of getting up and running. Using a reputable host and choosing solid themes and plugins is a great way to take some of the anxiety and complexity out of getting started with WordPress. Want to know anything else? Let us know in the comments.